Adaptive Growth sells an inexpensive and unlimited use license for its approach to describe and document how a business operates and works business transaction by business transaction. The work is done by the using company themselves and the results can be stored in a reusable and maintainable database, saving thousands of dollars for future projects requiring the data and the requirements for how a business operates and works. Projects of all kinds fail when critical expectations are not met. Companies initiating projects to implement software technology experience the highest rate of failures because they don’t dedicate the resources and the time to describe and document how their business operates and works before they initiate a software technology project. Companies who license our approach want to ensure success for projects to: acquire and implement software technologies, especially ERP, process improvement strategies, new market discovery projects or projects to improve their company’s day-to-day operational life. However, what we did invent is an organized, reusable approach for applying these tools to most any kind of business project, especially the specific problem of enterprise software project failures. 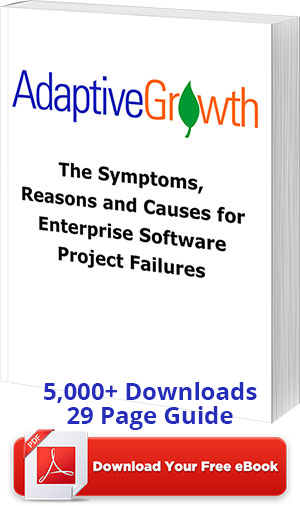 Failures continue to occur in software technology acquisition and implementation projects because companies don’t know what they’re asking for when they set out to acquire a new piece of business software. If you ask most people in business how acquiring business software is different from acquiring the rest of the many things their companies make and buy, pretty soon they’ll mention that in some ways software is invisible. It can be hard even to see it and to distinguish it from other software, but it is even harder to inspect it, the way they’d automatically inspect a new lamp or desk or truck, or pallet of ball bearings when they first receive those things. This difficulty is so obvious that it tends to mask an even more difficult problem: the fact that companies often set out to commission or buy new business software that they’re unable to describe very well. They’ll usually leave it up to a consultant or a software seller’s experience to tell them how their business should operate and work based on the software they have sold or implemented at companies like theirs.